The House of Marley isn’t the typical personal audio brand, endorsed by a music artist. The company’s products support 1Love – the charitable organization of Bob Marley’s family which is dedicated to supporting youth, planet and peace. In a nutshell, the company’s products make you feel good about your purchase well before you have connected them to your device of choice. Let’s find out if they are worth your money by taking a closer look at the Zion earbuds. The House of Marley Zion earbuds come in a compact, cool-looking box, made of recycled paper. Inside it, you will find the headphones, four extra pairs of ear tips, a pouch made of organic cotton, and some booklets. Overall, I found everything I needed in the earbuds’ retail box. The carrying pouch, along with being cool-looking, is also easy to fit in a jeans pocket. As far as looks are concerned, the House of Marley Zion earbuds pack tons of personality. Made of recycled aluminum and sapele and maple wood, the headphones look as premium as it gets these days. The fabric cord on the other hand, has the color pattern of the Jamaican flag. All in all, the House of Marley offering makes most of its competitors look generic in comparison – a feat which helps the product stand out in the crowded market. The earbuds are available in two colors – midnight and mist. In more simple terms, those two translate into black and silver. Build quality is flawless, save for one bit. The paint of black colored version, which I had the opportunity to spend time with, appears prone to chipping if the headphones are not handled carefully. I found myself putting the headset in its carrying pouch with a good deal of attention. It is not a deal-breaker – the headphones will hold up quite well, so long as their metal bits are not interacting with each other when carried. Living with the House of Marley Zion earbuds on a daily basis has been a breeze. I’ve been lucky enough to have the standard fitted ear tips work perfectly for me. In case, they don’t work for you, you have four more options with different sizes in the retail package. Despite the use of metal in their construction, the headphones feel light. Prolonged usage was not an issue. The fabric-covered cable, along with looking pretty, is tangle-free as well. In the headphones’ price range, such a feature is a must, so it is great to see that base covered. The three-button remote control worked well with iOS devices. Should you connect the headphones to Android hardware, you can still make phone calls, but won’t have the volume control at your disposal. 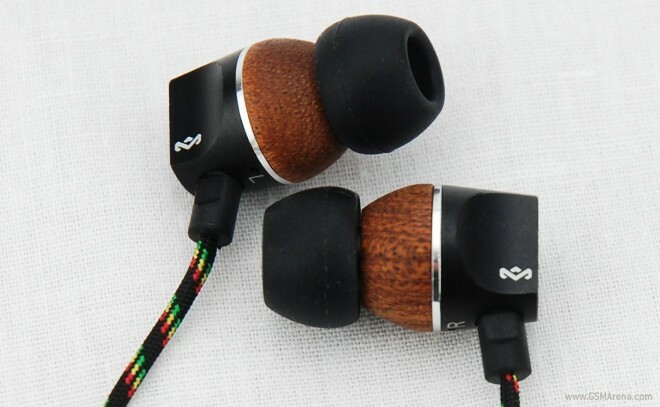 On paper, the House of Marley Zion headphones are mostly similarly equipped to their peers in the same price range. They feature a 9mm driver and a dynamic micro speaker with neodymium magnet for sound reinforcement. Frequency response ranges between 10 Hz and 22 kHz, while impedance is 16 Ohms. The sonic experience with the headphones is truly memorable. Thanks to the use of wood in the construction, bass sounds pleasantly soft and natural without trying too hard. Even at high volume settings, when many headphones tend to lose quality, the House of Marley Zion earbuds produced powerful, yet clear sound. High and mid-range tones sounded good too. Keep in mind though, that the headphones have a knack for bass – much in line with their reggae background. If you plan on listening classical music often, you might be better off looking elsewhere. Call quality was flawless when tested – nothing to frown at on this occasion. Priced at $99.99, the House of Marley Zion headphones offer visual character in spades, as well as a truly distinctive sound experience. If powerful, yet natural bass is what you are after when enjoying your tunes, without compromising on the rest of the sonic experience, few if any competitors will match the earbuds at this price range. I do therefore, find the House of Marley creation very easy to recommend.